Should you buy a petrol, diesel, LPG or CNG car? For the last three years, petrol prices have been consistently rising. And since the petrol prices deregulation in June 2010, prices have risen by as much as Rs18.49, a 38.57% increase from Rs47.93 in April 2010 just before deregulation. The current price takes into account the recent cuts of Rs3 per litre (considering the recent cuts, the first two in three years). Compare this with the prices of diesel, compressed natural gas (CNG) and liquefied petroleum gas (LPG) that are still controlled by the government: currently diesel is at Rs40.91 per litre, CNG at Rs32 kg and LPG at Rs39.54 per litre. Between April 2010 up to the present, diesel prices have gone up from Rs38.10 to Rs40.91, an increase of 7.37%. In the same period, LPG prices have gone up from Rs29.96 to Rs39.54, an increase of about 32%. CNG’s percentage increase is high but prices are still very affordable: it has gone up from Rs21.90 to Rs32 in the same period, an increase of 46.11%. The low costs of diesel, LPG and even CNG may tempt you, especially since even luxury cars are now coming up with diesel and CNG versions, but you need to flip the cost coin to look at the real picture. You also need to consider other aspects before making a decision. 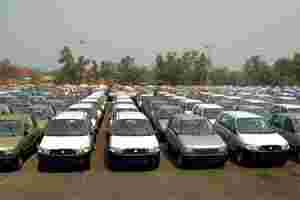 Cost of car: Though diesel, LPG and CNG are cheaper than petrol, the price of diesel, LPG and CNG cars is higher than that of petrol cars. These days most cars come with a diesel version, but only a few come with LPG or CNG versions. However, you can get an LPG or CNG kit added to the petrol version, which means the car cost increases here, too. An LPG kit typically costs Rs15,000 and a CNG kits is worth around Rs30,000. Remember that CNG is available only in select cities. Diesel cars are the most expensive and petrol cars the cheapest. When it comes to in-built versions, the price differential becomes higher if one were to take into account the cost of financing. “Since CNG, LPG and diesel cars are costlier than petrol cars, the amount of interest you need to pay on your car loan would be higher in these cars," says Nikhil Deshpande, research analyst, Pinc Research, a Mumbai-based brokerage firm. 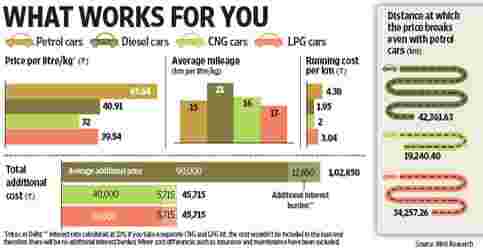 Mileage and running cost: In terms of mileage, diesel cars are highest in the pecking order, followed by CNG, LPG and petrol cars. But since CNG is considerably cheaper than diesel, the running cost, which you incur for travelling per kilometre, works out to be cheapest in CNG cars, followed by diesel, LPG cars and lastly petrol cars. When you translate the fuel price into kilometres traversed, if a litre of petrol will help you cover 15km, CNG will take you through 16km, LPG through 13km and diesel will take you as far as 21km. Insurance cost: The higher the cost of the vehicle, the higher would be the premium for car insurance. So this would be the highest for diesel cars, followed by CNG and petrol cars. However, if you take a separate LPG or CNG kit, the insurance cost would be as per the petrol version. The difference in insurance cost, however, is minimal. Maintenance cost: Earlier, the cost of maintaining a diesel car was very high as compared with that of petrol cars, but things have changed now. “With technological progress, the difference has reduced substantially. In fact, in case of petrol and CNG cars, you would incur virtually the same maintenance cost and Rs2,000-2,500 more in case of diesel," says Deshpande. Even for LPG versions, the maintenance cost is almost the same as in petrol versions. Agrees Vinay Saboo, a Hyderbad-based Maruti cars dealer. “With technological advancement, the difference in the maintenance cost of a diesel and petrol car is not much. The same also applies to CNG cars," he says. Though petrol cars cost less in the initial years owing to low sale price, interest and maintenance cost, low fuel cost and superior mileage give both diesel and CNG options an edge in the long run. LPG, too, is better than petrol in terms of low fuel cost, but it gives less mileage. But the benefit would accrue in a diesel car as compared with a petrol car only after you have driven at least 42,361km (see graph); you have to cover at least 19,240km in a CNG car to benefit over a petrol car and at least 34,257km in an LPG car. CNG is the cheapest among the four variants. You would break even with a petrol car in about one and a half years if you cover 1,000km per month. If you wish to buy a car for at least 5-10 years and travel close to 1,000km on a monthly basis, you would be better off with a diesel, LPG or CNG car. But to select among diesel, LPG and CNG, you should take into account factors such as resale value, pick-up and fuel availability. While the lower running cost of CNG would help you save a few thousand rupees over diesel cars, other factors weigh in favour of diesel cars. Typically, for the same number of kilometres traversed, diesel cars command better resale value than petrol, LPG or CNG cars. “The availability of diesel cars is less and, hence, they get better resale value than petrol cars," says Saboo. However, if you are one of those who keep changing your car say after every two to three years, you may be better off with the petrol version. Diesel and LPG cars would then turn out to be costly for you.